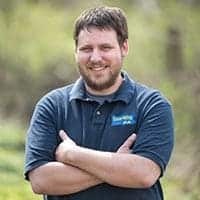 Located just north of Philadelphia is Bryn Athyn. 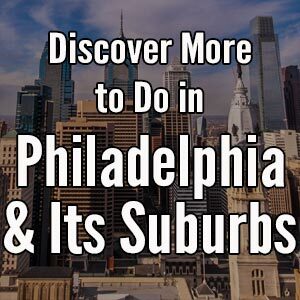 While some parts of this Montgomery County community look like any other Philly suburb, that certainly isn’t the case on a hill in the southwestern corner of the borough. Here, two large castle-like buildings sit next to one of the most impressive cathedrals in Pennsylvania. These three buildings are part of the Bryn Athyn Historical District and offer a unique look at the impact that one family had on this corner of the state. 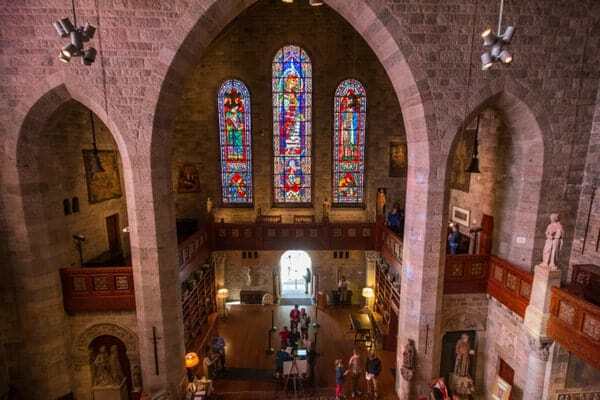 While Cairnwood Estate offers a nice look at the history of the Pitcairn family and the Bryn Athyn Cathedral is breathtaking, the Glencairn Museum offers what might be the best religious art museum in the northeast. Looking down at the entrance to Glencairn Mansion. Glencairn was the last of these three buildings to be built, having been completed in 1939 after 11 years of construction. Built by Raymond Pitcairn and his wife Mildred, the home’s name is a hybrid of her maiden name (Glenn) and the Pitcairn family name. Glencairn contains 90 rooms on 10 stories, including a grand hall, a majestic chapel, and a breathtaking view from the top of the tower. 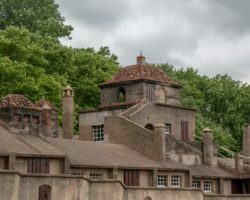 Like the nearby castle-like buildings built by Henry Chapman Mercer in Doylestown, Pitcairn had no formal architectural training, but managed to build both Glencairn and Bryn Athyn Cathedral despite this. 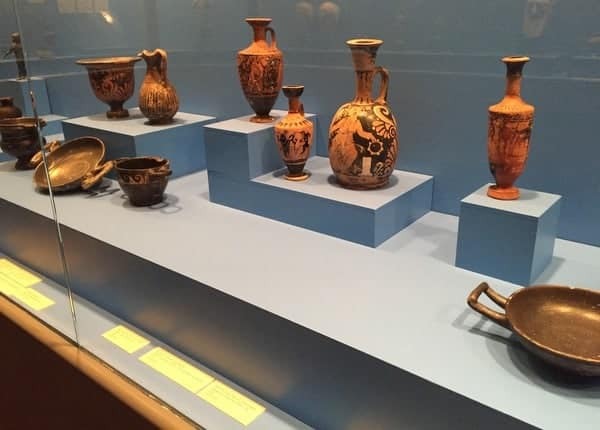 Items from ancient Greece on display in the museum. Raymond Pitcairn would live in the home until his death in 1966, and his wife, Mildred, would live in the home until her death in 1979. The next year, the home was turned over to the Academy of the New Church, with whom the Pitcairns were vital supporters. 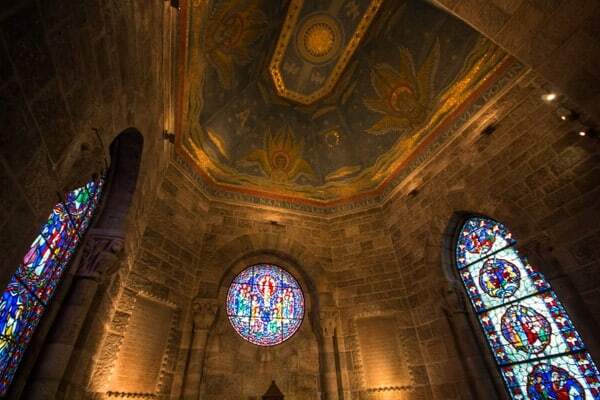 Today, Glencairn is filled with some of the most priceless pieces of religious art in the world, dating back as far as third millennia before Christ. 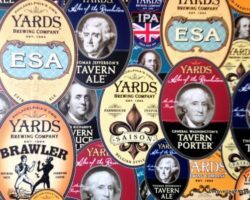 The cultures on display are as diverse at the Egyptians, Romans, and Native Americans. These pieces of religious art offer a unique glimpse at how these works have changed throughout history. 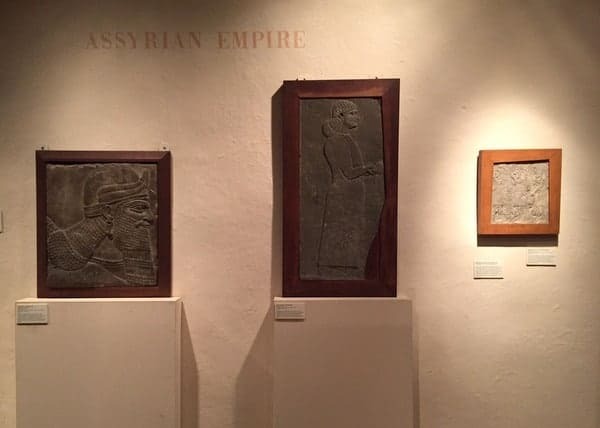 Items from the Assyrian Empire at Glencairn Museum. The items in the museum come from two local sources. Raymond Pitcairn collected Medieval art and architectural pieces, as well as stained glass. The rest of the pieces were collected by Raymond’s father, John Pitcairn, and William Henry Benade, the first bishop for the Academy of the New Church during their travels in Europe. Tours of Glencairn are offered throughout the year and last approximately 90 minutes. They start with a 15-minute video about the home before taking visitors through the highlights of this very large and impressive museum. Visits include access to the Great Hall, Upper Hall, the chapel, the Pitcairn’s bedroom, and tours through a variety of the rooms filled with religious art. The ceiling of the chapel in Glencairn. 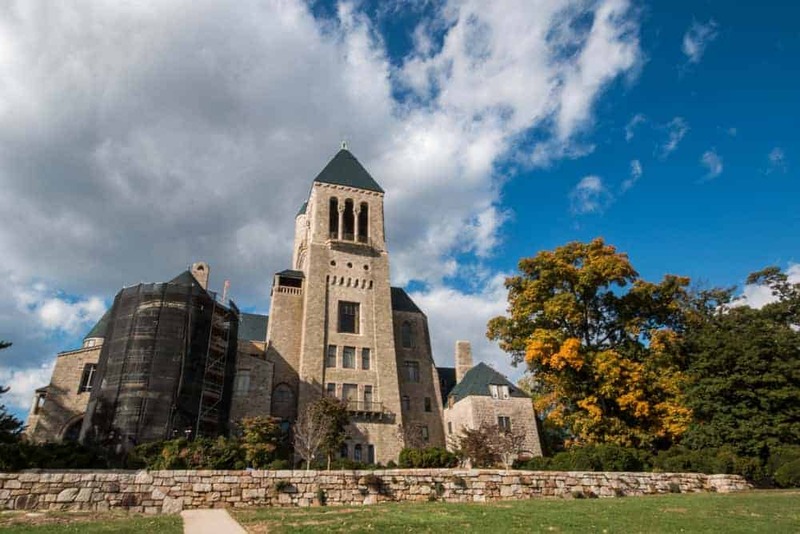 The tour also includes an elevator ride to the tower at the top of Glencairn. 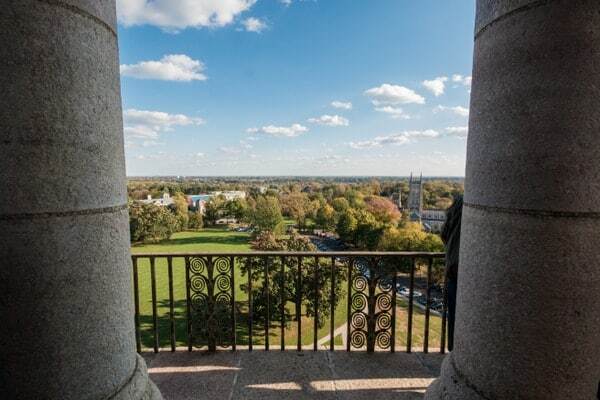 From here, there is an impressive view of the countryside and Bryn Athyn Cathedral. 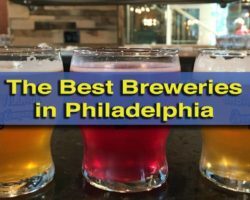 Looking even further, there is a great view of the Philadelphia skyline. Make sure you bring a camera with some good zoom, though, as a regular camera won’t be able to fully capture this beautiful, but distant view of Philly. The impressive view of the countryside from the tower atop Glencairn. If you want to explore Glencairn at your own pace, the museum is open twice a year to self-guided tours. These self-guided days happen during the museum’s two main events: Medieval Days in the fall and the Sacred Arts Festival in the spring. While these events make the museum very crowded, it can be nice to explore the collection at your own pace and see each of the rooms that are open to the public. Glencairn Museum and the entire Bryn Athyn Historical District is one of the hidden gems of Pennsylvania. 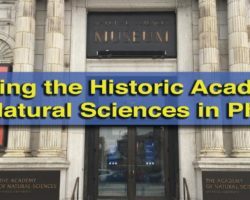 Located just outside of Philadelphia, this museum’s collection and stunningly beautiful architecture make it one of the most interesting places that I’ve visited in this corner of the state. Whether you love religious art, history, or interesting architecture, you won’t want to miss this fantastic museum. Note: My visit to Glencairn Museum was hosted by the site. However, the opinions expressed are my own.